This tutorial is to show you a step-by-step demonstration of converting Flash videos downloaded from YouTube, Hulu, Google Video, etc. and enjoying them on your BlackBerry mobile phones, such as BlackBerry Storm 2, BlackBerry Bold 9700, BlackBerry Curve 8520 and the new BlackBerry Curve 3G to come this month on T-Mobile Network, so that you can fit in your pocket and watch YouTube FLV videos or tv shows while waiting for a bus or sitting in a park eating lunch, view some Work-related information downloaded from video sharing site even when you are on christmas vacation without laptop. 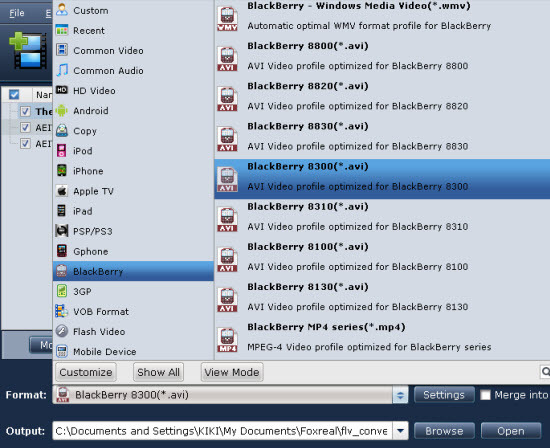 How to convert FLV to AVI for BlackBerry? Click "Add" button to import your target FLV file into the FLV to AVI converter program. Now the FLV to AVI Converter supports all kinds of FLV files without installing extra codecs, which includes On2 VP6 video FLV, H263 video FLV, NellyMoser audio FLV, etc. Select *.avi formats (Divx AVI, Xvid AVI or Divx HD) in the pull-down menu of "Format" as the output format. Click "Settings", you are able to change the video/audio settings: video codec, frame rate, resolution (frame size), etc. Actually, the default setting profile offered for conversion has the best quality. But, if you like, you can adjust them for our reference. For example, you can customize avi video resolution: 160*120 176*144 240*180 320*240 355*288 480*270 720*576 800*600 1024*768 as you like. Hint: If you choose "mp3"as the audio codec, you may encounter some problems. The MP3 compressor does not work correctly in video files and often causes the conversion to abort in the middle. And we suggest that it's better not to use this one. When you have completed the settings, you can go on to select an output directory by clicking "Output" button. And then click "Convert" in the main interface to start FLV to BlackBerry conversion. Once the conversion is done, you can transfer the converted AVI files to your BlackBerry for playing. Defined by Microsoft, AVI stands for Audio Video Interleave. It is a special case of the RIFF (Resource Interchange File Format). AVI is the most common format for audio and video data on the PC, and it is most suitable for editing. AVI is Microsoft's response to Apple's QuickTime technology. Early AVI files were limited on choice of video and audio codecs, quality, and resolution. However, with the introduction of DirectShow, AVI became a very flexible and powerful architecture. Some new codecs, such as DivX and XviD enable AVI files to have similar or even better quality than DVD. How to Free Trim FLV ?